Melt in your mouth Pumpkin Spice Meringue Cookies are the perfect fall treat! Plus I’ve got some tips and tricks for meringue success! And, a sweet giveaway at the end of the post! It’s that time of year when it seems Pumpkin Spice becomes all the rage. From lattes to coffee creamers, it’s pumpkin spice all the time! It’s no secret I love Pumpkin Spice (and lattes and coffee creamers), which is why I’m super excited that I can now use a Pumpkin Spice Extract in my baking. 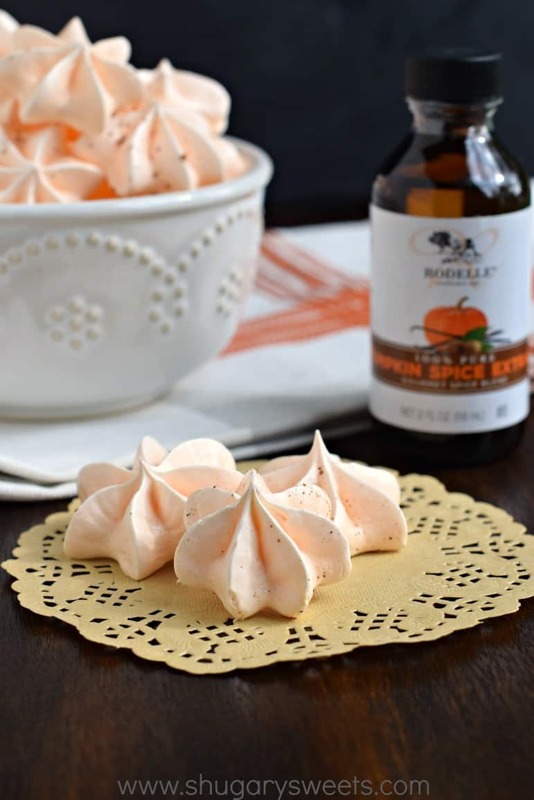 Did you know that Rodelle (yes the brand you probably think of when it comes to vanilla extract) has a new Pumpkin Spice Extract? You can purchase it on Amazon, FYI. Imagine how amazing all your pumpkin desserts will be when you swap out the vanilla and add the PSE instead? Pumpkin Muffins, Pumpkin Coffee Cake, Pumpkin Cupcakes. All better because of this new extract. I’ve been working with Rodelle this past year to bring you delicious treats using their extracts and cocoa powder. So when they told me they would like me to create a recipe using their new Pumpkin Spice Extract, my mind whirred with ideas. In the end, I thought it would be fun to create a recipe that the only flavoring is the extract. These Pumpkin Spice Meringue Cookies are simple, melt in your mouth cookies, with all the flavor of pumpkin! Always start with a clean, dry mixing bowl. Any trace oils will prevent your egg whites from developing stiff peaks! When separating your eggs, I prefer to use room temperature eggs. I find the egg white separates from the yolk much easier than when it’s chilled. Save those egg yolks and make some homemade lemon curd!! Once you add your egg whites to the bowl, give them a quick whisking! I prefer to use my electric mixer with whisk attachment when making meringues. I find it gives a more “even” beating! After a quick whisking, add in your vinegar, corn starch, pumpkin extract and a drop of orange food coloring (I use gel colors). Turn your mixer on high and slowly add the sugar. Step away and let it do it’s thing. Mine takes about 4 minutes to get some good stiff peaks! Line baking sheets with parchment paper (this is a must!). The parchment paper allows the meringues to rise, without sticking to the pan. Once you’re done, they lift off so easy without cracking! You can drop your meringue by spoonful onto the parchment paper, or make pretty designs. I fill a disposable pastry bag and use various decorating tips to make stars and swirls. Pipe all your meringues onto your baking sheets. Sprinkle with a little bit of nutmeg! Cook meringues on a low heat for a long time. I do mine at 200F for about 80 minutes. DO NOT OPEN THE OVEN DOOR. Once they are done baking, DO NOT OPEN THE OVEN DOOR. Have I said that yet? Seriously. Turn the oven off, but keep your meringues in there. I like to make my meringues after dinner. Cook and turn oven off. Then I go to bed. When I wake up, they are perfect! If you make them during the day, let them sit in the oven for about 3-4 hours before taking them out. Do not bake them when it’s humid. Do not store them in your humid house. They will become sticky. Guaranteed. ENJOY! Line baking sheets with parchment paper (I used 3 15x10-inch sized baking sheets). Set aside. In a clean, dry mixing bowl, whisk the egg whites for 30 seconds until frothy. Add in vinegar, cornstarch, food coloring, and Pumpkin Spice Extract. Turn mixer on high and beat. While beating, slowly add the sugar in a steady stream. Beat for 4 minutes on high until still peaks form. Spoon meringue into a large pastry bag with a tip of your choice. Pipe onto parchment paper lined baking sheets. Sprinkle immediately with nutmeg. Turn oven off and allow meringues to set 4 hours or overnight (DO NOT OPEN OVEN DOOR DURING THIS TIME). Once set, remove from parchment paper and enjoy! Here are some of my favorite recipes using Rodelle products!! 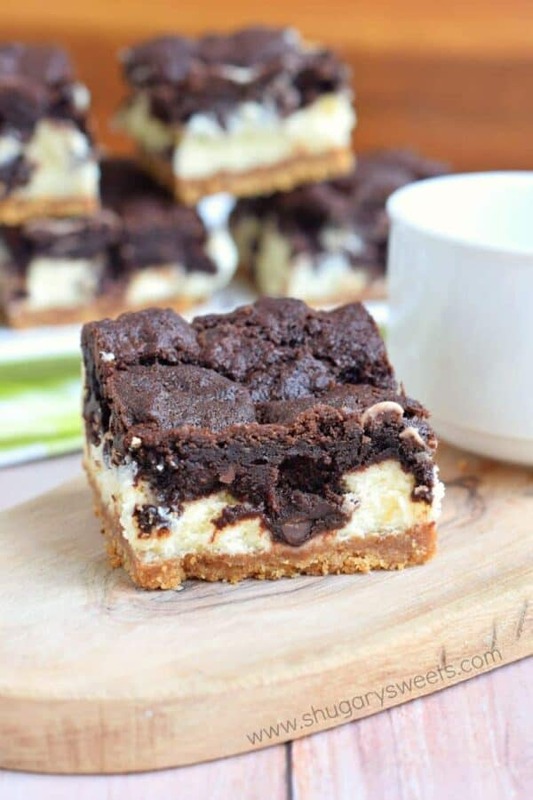 Chocolate Cheesecake Bars: graham cracker crust, creamy cheesecake, and chocolate cookie top. What’s not to love?? 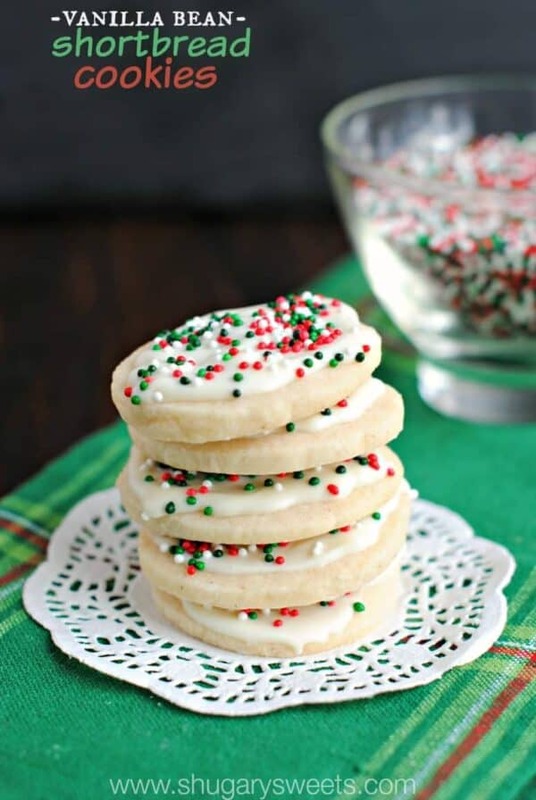 Vanilla Bean Shortbread Cookies: use any color sprinkles for any occasion. These are so buttery and good! 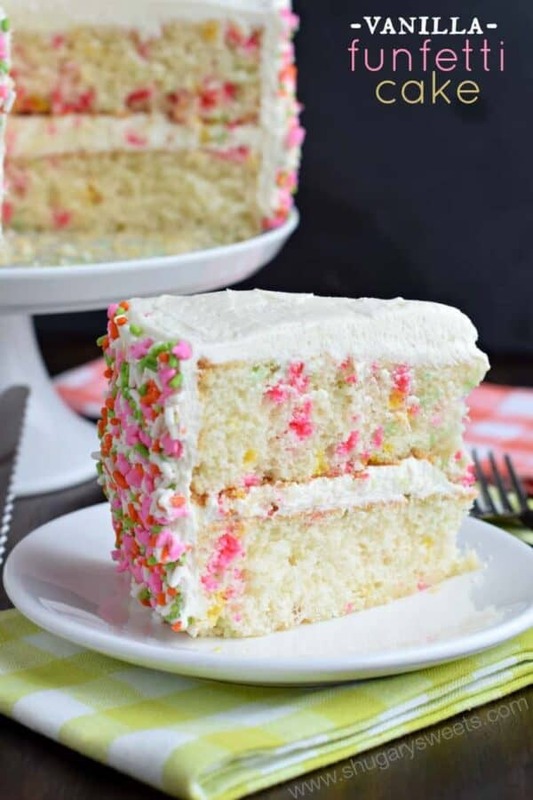 Vanilla Funfetti Cake: a from scratch funfetti cake filled with creamy vanilla buttercream frosting!! I LOVE baking with Rodelle! I SO want to make a Pumpkin Spice whipped cream with this new extract! Your cookies look super tasty too! These are gorgeous! Meringues always scare me so I can’t wait to use your tips to try them out! I haven’t tried Rodelle before but I hear they have some great products! I love making meringues but haven’t made them in a while! Time to take care of that! I would love to make pumpkin spice snickerdoodle cookies! 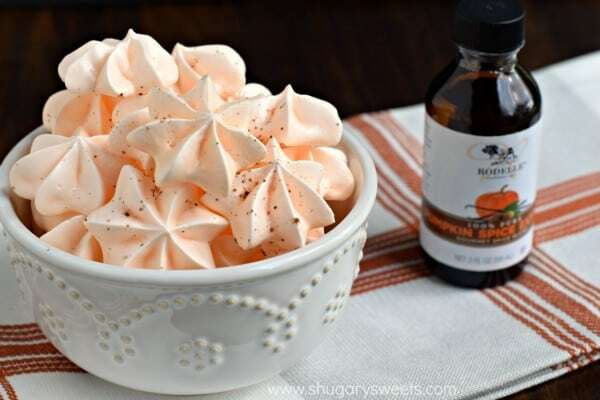 I’d love to use the pumpkin spice extract in my sugar free meringues. Your cookies sound good, but I’m thinking about some muffins. The possibilities are endless you know?! What a great flavor for meringues! Can’t wait to give these a try! I’d like to use these products to make a chocolate pumpkin cheesecake. I’ll save the brine for the turkey though! What beautiful meringues! I’ve never tried making them before, but these are tempting me because of the pumpkin spice extract… I had no idea there was such a thing; how brilliant, since everyone seems to be obsessed with this flavor:) I think it’d also go well in buttercream, so I’d probably use it for that after trying your meringues. I think it would be delicious in buttercream!!! 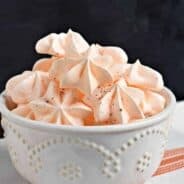 I would like to make these, those are genious tips and tricks for meringue. I think I would try them in a blondie brownie and see how the Pumpkin Spice Extract makes a difference. Love this time of year with all of the Pumpkin Spice foods and drinks! Definately would love to make your cookies. My kids want pumpkin cupcakes so I would like to make those with the pumpkin spice extract. 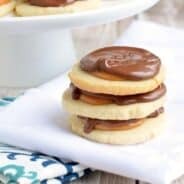 I would first make these cookie! They look great! The Vanilla and Almond Extracts would be great for my frosted sugar cookies. Thanks for the giveaway! Oh my goodness. Pumpkin spice everything! The sky is the limit what I would use it for but I would start with some type of cookies —most likely yours! Thanks for a fun giveaway! I love meringue cookies, especially since I eat gluten free now. I would also love to try some of the extract in my morning chocolate protein smoothies. Been loving putting a little pumpkin and some spices in it lately. I would love to try these meringues. I have never made any. I have used Rodelle vanilla. W-e-l-l…… I would definitely make your meringue cookies, it would be a first for me. Then I would use the extract in scones & in our whipped cream for the pumpkin pie on Thanksgiving!! Yummers !!! Those look absolutely beautiful and delicious. 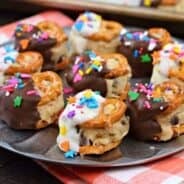 If I were to win I would totally love to make your cookies and I would also love to try the Vanilla Bean Pizzelles Recipe! Should I win, I would make my favorite: Pumpkin Spice Cake with raisins, walnuts, and chocolate chips. I also make a mean Pumpkin raisin, walnut, and chocolate chip cookie. What a clever girl you are! My grandmother used to make a version of meringues called Forgotten Cookies when I was a child. I was amazed when they transformed from the wet batter to crispy cookies in the closed oven. Love the Pumpkin Spice flavoring touch. Love me some Rodelle in any flavor! I love the name Forgotten Cookies. I bet she came up with it because they stayed in the oven and forgot about them. I’ve done that. Found out the next day at dinner as I was preheating the oven. WHOOPS. I would definitely make the PSM cookies! They would be a hit with all of my friends & family!! I would also like to try the Turkey Brine. I’ve had some great turkey that used brining. These are so stinking cute! Thanks for the meringue tips too. I’m not sure I could handle waiting overnight to taste test them though! MY FAVORITE COOKIES. I LOVE MERINGUES!!! CAN’T WAIT TO MAKE THE PUMPKIN SPICE MERINGUE COOKIES!!! That TURKEY BRINE sounds interesting!!! Something new to try. Thanks for the opportunity to win these wonderful items!!! Does it have to be white vinegar? Wow, swirly meringues! These are gorgeous! 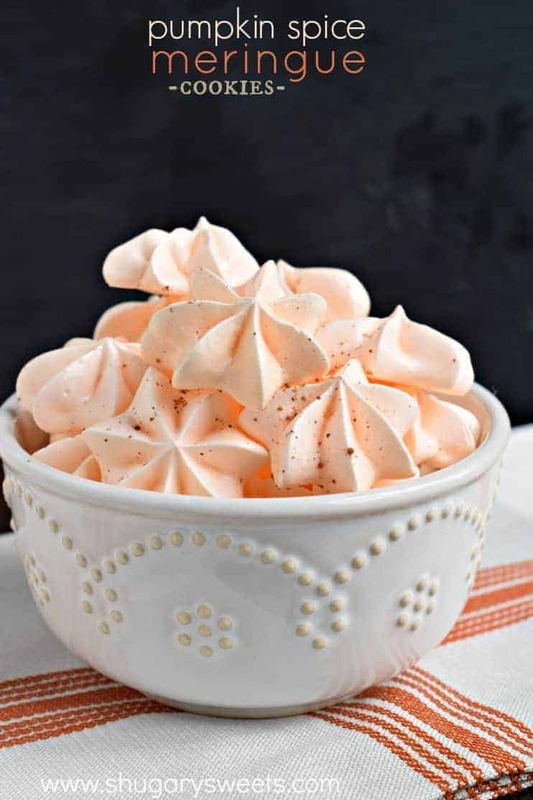 And my son is a meringue fanatic and he adores pumpkin, so you can bet I’m doing these for him! That will maybe buy me a hug. I’m cool with that. I would be making these Pumpkin Spice Meringue cookies. What pretty meringue cookies Aimee! Loving all those great tips too! Always afraid to make meringue cookies but this sounds easy. I’m going to try them! Of all the cookies I’ve made in my life, can you believe I’ve never made meringue cookies???!!! I’ll have to change that and make yours if I win! i would definitely try your cookies!!!! Your cookies look amazing but my mind is racing with possibilities!! It’s a toss up between pumpkin spice marshmallows, which I think would be incredible in hot cocoa, or cream puffs filled with pumpkin spice pastry cream. I can’t wait to get some and start experimenting! If I won I would totally make these!! They look so yummy. Pumpkin everything! I would also use the almond extract in everything because I am an almond addict. So good. This would fuel my baking addiction in the best possible way. Oh Almond extract is my achilles heel, so much awesome flavor it adds to anything. I would use the Rodelle Almond Extract in my mother’s recipe for Bonket. It is a family tradition for the holidays. While my children and grandchildren love and expect it, perhaps Rodelle Almond Extract will add the missing flavor from my childhood memory. Perhaps it is just the love that she put into everything she created as well as her that I am missing. 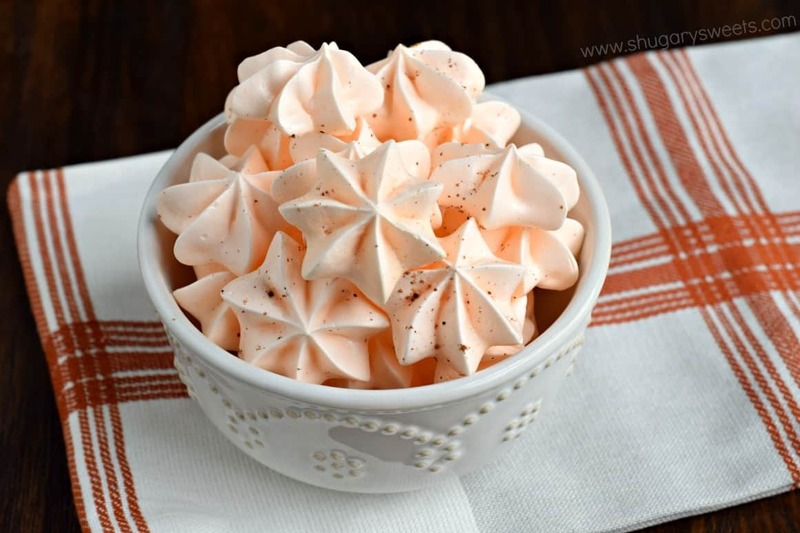 Wow pumpkin spice meringue ! So creative! What a great idea! 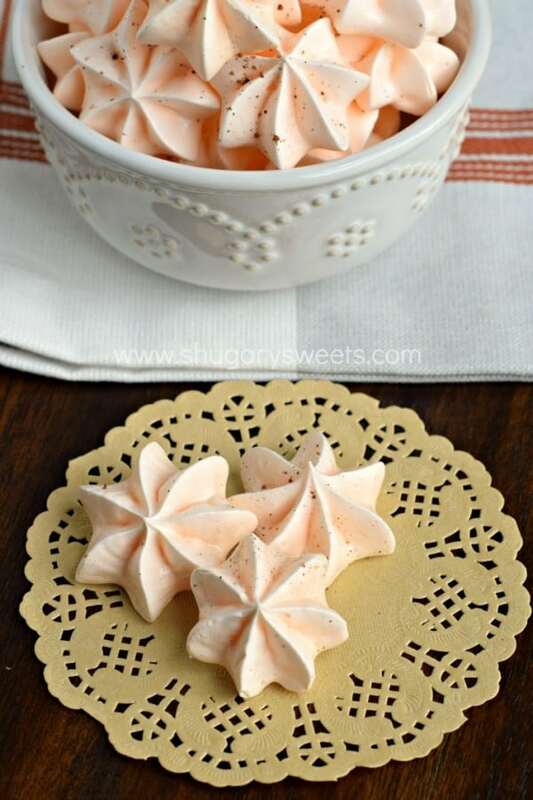 I would love to make these Pumpkin Spice Meringue Cookies. 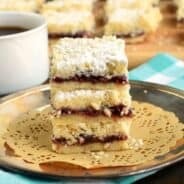 I would also make the Chocolate Cheesecake Bars. Oh the deliciousness! Homemade pumpkin spice pudding sounds really good now! I would try it in my oatmeal! Perfect fall addition! I would definitely try the pumpkin spice extract! And these meringues look amazing! What a treat! So light and delicious! I am wondering why you put vinegar and cornstarch in the meringues instead of the cream of tartar. My granddaughter is allergic to corn and I am tempted to just use cream of tartar instead. What do you think? Can you tell me why you use the other? I never heard of this before. You can totally use cream of tartar if you prefer. I like the combo of vinegar and cornstarch to create a light and airy meringue, with just a hint of a chewy center.